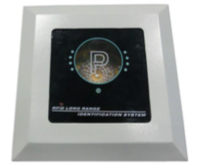 RFID Long Range Series Active Reader adopting high technology, remote directional module and RFID technology, the RFID reading system can receive the signal at around 3-7 meters away from the gate barrier (The environment will affect the reader performance). AY-M8C2 greatly reduces the drawbacks of waiting in queue to roll down the window and scan the card. It not only reduces the unnecessary fuel consumption. Besides, our active tag is usually dormant until it goes into the reading zone. With ultra-low emission of milliwatt power and below internationally accepted radiation limits.